Fourth-placed woman is Anne Jensen from Denmark, Saleta Castro is off the bike in fifth place, in sixth we have Verena Walter ahead of Kate Bevilaqua. They are within 6 minutes. Through 15 km Kramer is 3:00 ahead of Jammaer, but Degasperi is flying - he is at 4:56 in third. Km 15, Men: Mauro Baertsch ist at 8:30, Will Clarke is at 10:37. Miquel Blanquart is already in Top 6 - he is at 15:39 and making up a lot of ground. Diana Riesler is at Km 10. Degasperi is in second place! He has made it into runner-up-position is almost flying. We hear from the course that he is about 3:40 behind Kramer. Herlbauer is in 2nd in the women's - she is 17:47 minutes behind through 9 km. Caroline Livesey has passed Km 9: She is 26:38 back. Mauro Baertsch is at 7:34 through 35 km. Alessandro Degasperi has made the pass - that's what we hear from our spotter. We try to double check that info. Here he is, 2015 IRONMAN Lanzarote champion Alessandro Degasperi. Here comes Christian Kramer - runner-up after a very long lead. The crowd is cheering for a real champion. Mauro Baertsch takes third place - what a success. Alessandro Degasperi had a sensational run, although the conditions were absolutely tough: 2:47:16. Miquel Blanquart runs into fourth place. Bert Jammaer finishes in 5th place in his last race as a pro athlete. 5 km to go for Diana Riesler! Great race for the fastest age grouper: Malte Bruns from Germany ranks 9th overall in 9:32:47. Jon Wagg from Canada is on the marathon course now - why we tell you this? Imagine: This is his 186th IRONMAN! The finish line is ready for Diana Riesler - in a few moments she will celebrate the win at 2015 IRONMAN Lanzarote. Rieslers lead is just huge - Michi Herlbauer has passed km 37, 17 minutes down. She takes the win thanks to an impressive performance: Diana Riesler, 2015 IRONMAN Lanzarote champion. Riesler takes the victory in 9:56:04. We are waiting for today's runner-up, Austrian Michi Herlbauer. 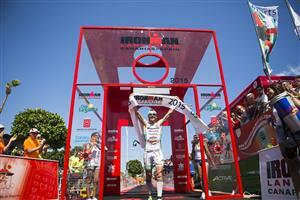 Michi Herlbauer takes silver at 2015 IRONMAN Lanzarote. 3.5 km to go for third-placed Caroline Livesey. Caroline Livesey runs into third place! And here comes Shiao-Yu Li! 10:31:57 - that's the time for Caroline Livesey, Shiao-Yu Li finishes in 10:33:43. Kate Bevilaqua, Alena Stevens and Saleta Castro are close together - and aiming for fifth place. They are within a minute. In between was German Verena Walter! We missed her at the timing through 35 km - and her she finishes in fifth place. 10:44:41.